Lots of posts today! 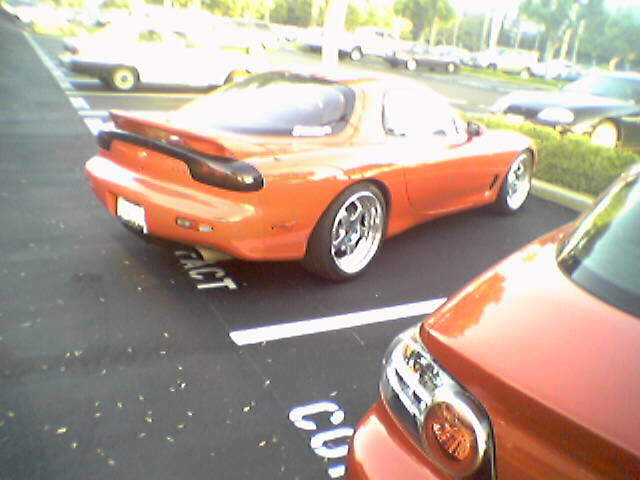 So I am leaving work and find my old RX-7 parked right next to me. It turns out that after I sold the car to Fred, he got a job as a consultant BREW QA tester for Qualcomm. So on occassion, I see the twin turbo R1 beauty. Fred has modified it quite a bit, added a lot of chrome under hood goodies, new suspension, 18" wheels and a new crazy looking carbon fiber hood. I generall prefer the original style of the car, but it does look pretty cool I must say. I will own one again one day. Or maybe the new RX-7 when it comes out. Or maybe a Lotus.